Thai beef jerky?! I was hesitant to try it at first because I’m not a fan of American beef jerky. But since I’m madly in love with almost every Thai food I try, I decided to take a bite. Once that chewy, crispy beef jerky with a spicy, zesty dipping sauce hit my lips, I was so so glad I tried it. 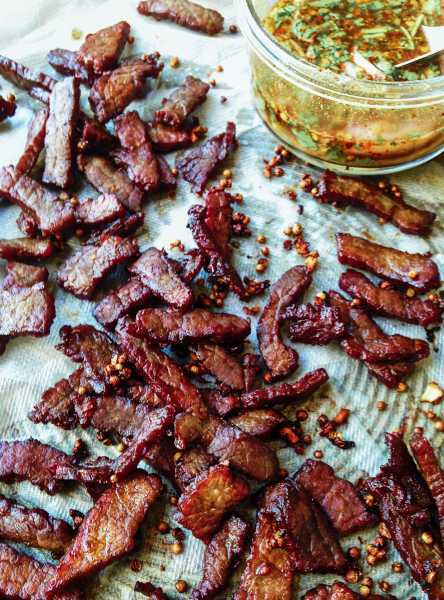 The Thai name for Thai beef jerky is Nuea Daet Diao, which is translated to Sun-Dried Beef because Thais dry it out by sitting it out in the super hot 110 degree direct sun heat. In Thailand it probably gets dried in about 10 seconds!! That means it doesn’t taste the same as beef jerky you might find at an American grocery store. In Thailand they lay it in the sun only until the exterior is dry, so inside it still has some moisture, and then the beef jerky is deep-fried briefly and served with a Thai red chili, sour, spicy dipping sauce! So so yummy, and it’s understandable why it’s an addictive beer snack in Thailand. We like to serve it as an appetizer or with sticky rice along with other dishes at a Thai-style family feast. It’s a lovely dish to do the prep work over the weekend, so you can have it as a quick weeknight meal later in the week. You can dry the meat first, and freeze it for up to 2-3 months beforehand, and just thaw the meat and then marinate it before you fry like the recipe says. You can also make the dipping sauce a few days ahead, so all you have to do day of is quickly marinate the beef, and fry it for a few minutes, and it’s ready! 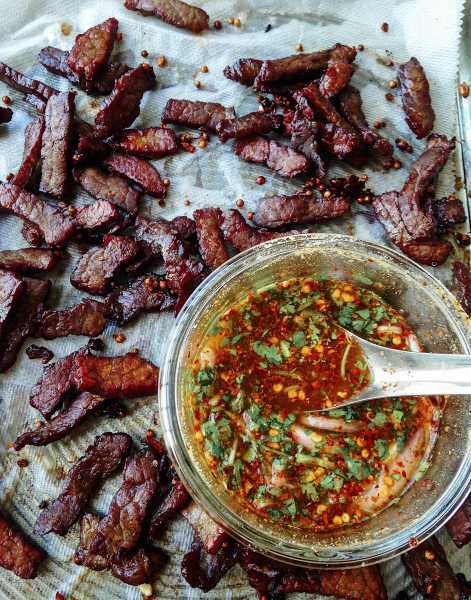 If you make this this weekend, I have to warn you that American beef jerky wont ever taste quite as good whenever you think back to your own homemade Thai beef jerky! 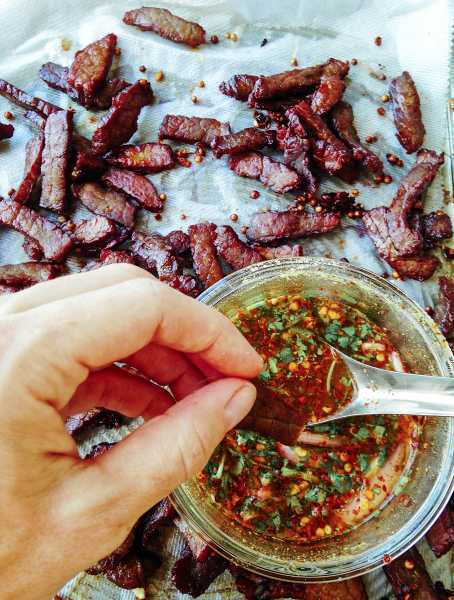 LOVE how Thai beef jerky is chewy and crispy and pairs perfectly with an easy Thai chili dipping sauce full of flavors like lime, shallots, cilantro, roasted rice powder and spicy Thai chili flakes! Cut the beef into strips about 4 inches long and 1/2 in wide. Place the meat on a large baking sheet, making sure the pieces are spread out and not on top of each other. If you want to dry the beef Thai-style, lay the baking sheet outside in direct sun for about 15-40 minutes or so, depending on how hot it is outside and how much sun you have. Dry one side until dry to the touch, and flip it until the other side is dry to the touch. Since we live in an apartment with no direct sun, we can't do that! We dehydrate the beef in the oven. For the oven method, place the baking sheet in the oven. Put your oven on its lowest setting, for me it's 220 degrees. But I prop the oven door open a few inches to help lower the temperature even more since really it should dehydrate at around 120 degrees. Let the beef dry out for about 25 minutes, and then flip it over to the other side for about 25 minutes or so. Once it feels dry-ish, soft and elastic, it will still have some moisture which is fine, take out the beef and marinate the strips in garlic, pepper, coriander, fish sauce, soy sauce and sugar for about 20 minutes. Fill a wok or deep pan with about 3 inches of vegetable oil or whatever frying oil you prefer. Warm the oil over medium high heat until it starts to bubble if you drop in a bit of beef. Fry the beef in small batches, stirring it constantly for about a minute until it starts to turn a deep brown, as shown in the pics. Use a wire mesh strainer, or slotted spoon to place the beef on a baking sheet with paper towels. To make the dried chili dipping sauce, add all the ingredients to a small bowl. Taste until it reaches your desired flavor profile. I like it more sour and spicy tasting, but if you like it more salty or sweet, go for it. Store in the fridge and use within three days. 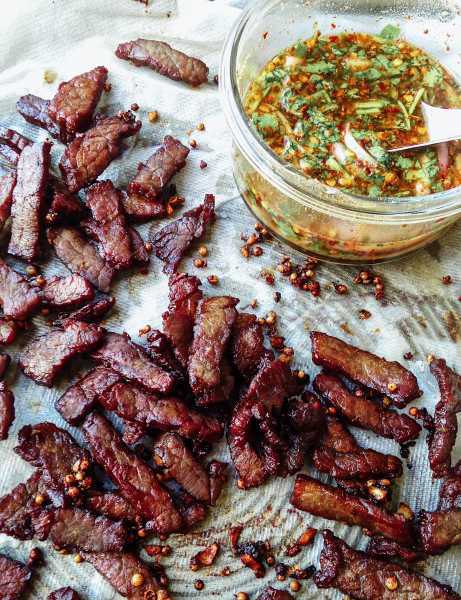 Serve the Thai beef jerky as an appetizer with the dipping sauce, or have it alongside sticky rice with other yummy Thai dishes. You can also make the sauce in advance and keep it in the fridge for up to 3 days. Recipe is slightly adapted from one found in one of my favorite Thai cook books, Simple Thai Food by Leela Punyaratabandhu. This is amazing. We dont have a Thai restaurant who makes Thai Beef Jerky where we live. So this helps a ton! We like to eat it with Sticky Rice and a spicy, limey, garlicky fish sauce! Yay!! Yes! 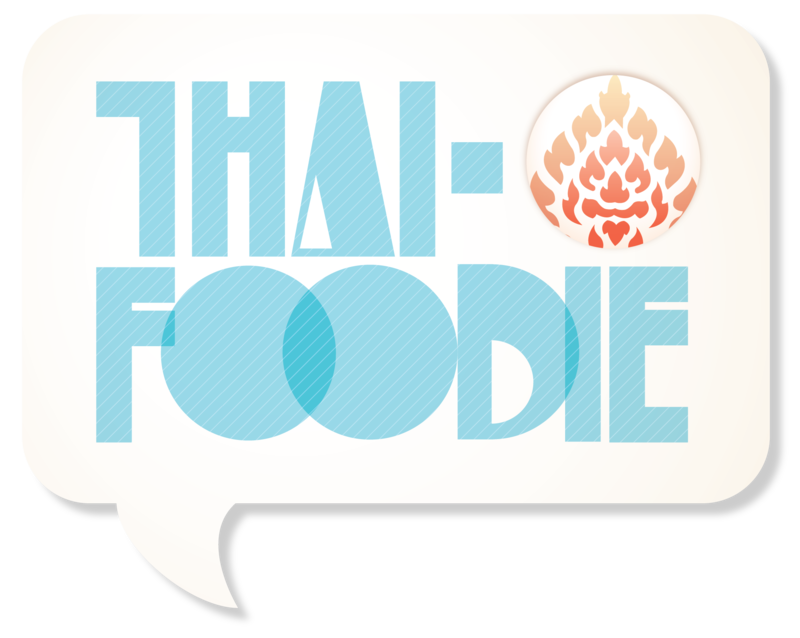 It’s hard to find Thai beef jerky at American Thai restaurants, so Im so glad we could help you out!! 🙂 We love it with sticky rice and the dipping sauce too!! Great question! Totally understandable why you wouldn’t want to leave your oven open! Lol! Yes, you can use a dehydrator to dry the beef. Depending on what you use it could take from 15-30 minutes, but the best way to judge if it’s done is if it is dry on both sides, and the texture still feels soft and elastic. Hope it works well for you!